Roy helps you navigate the first round of the byes. Use the comments section to discuss your plans with the community. Ok, whole new ball game. 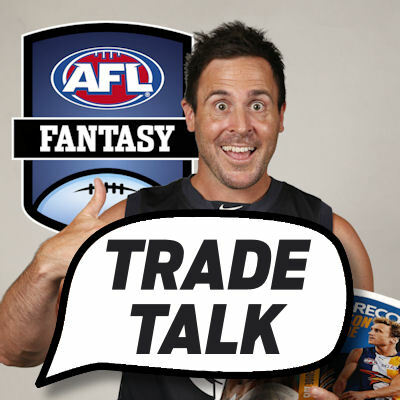 We have a challenge ahead over the next three weeks navigating the byes, but remember, we have three trades each week to assist and our scores comes from the best 18 players on our fields. Minimising doughnuts and ensuring that our teams are better at the end of the byes than when it began is essential. To make that happen, resisting the temptation to straight swap premiums each week will be important. Obviously, not all the players mentioned today will be relevant depending on bye structure, so trade carefully. Logan Austin (DEF, $294,000) -39, 112. Increased by a last 72K last week after he pumped out another massive score of 112. He is playing loose man and is currently the go to guy back there, evident by the 14 marks he took. He is now averaging 105, a far cry from the 30 he averaged at Port Adelaide. Yes, we have missed the boat to some extent, but the price rises and scoring ceiling over the byes would be very handy. Paul Ahern (FWD/MID, $207,000) -15, 92 made his long awaited debut and didn’t let anyone down with an outstanding performance that made the wait worthwhile. Unfortunately, many of our teams are heavy in the round 13 bye and that’s when the Roos are having the week off… But having said that, he looks like a must have in the long run, I just hope it wouldn’t cause a 0. Justin Westhoff (MID/FWD, $659,000) 115, 96. Based purely on BE, you may be wondering why the Hoff is a headline act here, but he looks to be the most consistent option from the Power and Suns who can serve as an anchor over the next three weeks. He has handy DPP between the mid and forwards and is averaging 101 for the season. I like his form in Adelaide where he has 132, 75, 118 and 115 this year and it just so happens he plays the next three games there. Michael Waters (FWD/MID, $575,000) 66, 102 is going under the radar, currently only owned by five percent of the competition despite enjoying a career year. He has a three round average of 109 and only remains this cheap due to an injury on 11 in round six which broke up a run of hot scores including 92, 99, 125 and 102. He has the round 14 bye, so will be very handy in round 13 especially. Darcy Byrne Jones (DEF, $568,000) 79, 73 had his worst score for five weeks since embracing the increased responsibility without Hamish Hartlett. His 73 followed two scores of triple figures and although he is no Brayshaw… he will be there for the next three weeks, all of which are in Adelaide where he has scores of 104 and 95 in his last two. Touk Miller (MID, $625,000) I have had many questions come through about Touk as an answer through the byes, given the fact he will be there every week. Trades like this have merit, but are fraught with danger. His form is solid with scores of 106, 105, 107, 88 and 99 in his last five so his price is fair and he should be a solid contributor over the byes but you would want to be able to move him on pretty fast after the byes as he clogs a midfield spot. I wouldn’t do it. is it too early to get rid of guelfi even if it means that I can trade him to brayashaw. Mate.. You can’t trade yourself out surely, back yourself in for a BIG week!! Is it top 6 fwd ‘now’ or top 6 fwd at years end? Surely Jack Crisp is knocking on the door as a top 6 defender. McLean isnt playing this week. May as well hold on trading til next week. I’m doing that thanks Shags. It’s either Billings to Westhoff with 220k in bank for him next week or Gowers to Westhoff and have 93k in bank. Go Billings to the Hoff mate and bank up the cash. Ride Gowers through the byes as he has that valuable Rd 12 bye. Coaches can be crippled by short-term thinking… ANB and a few others aren’t even on my radar for this very reason. Suits me though, as blokes who are go unnoticed and become PODs in the run to the line. What do we think of Mihocek? Stacked in defence for the round 14 bye so trying not to get Austin, but looking for a downgrade. Does he have good job security? I have stayed away from Brayshaw because of the chance of getting a head knock finishing his season, but have succumbed this week as his form and BE is too good to miss and lessens the risk/loss. I had the same dilemma 2 weeks ago. Crisp has scored 4 hundreds on the trot now. I can see him being top 6. Brayshaw is good too and will be my Seedsman or Hibberd replacement rnd 14. WHY IS GAFF NOT IN THE TOP 8 MIDS????? Mate his form this season says otherwise. Perhaps in seasons past but have a look at his scores. Low of 86 and only 4 under triple figures. Also has a high ceiling. Him and Macrae are in my team by rd 13. Turns out “blocking” a trade doesn’t actually block it and this snake has managed to trade IN Simpson, Brayshaw, Big Stef, Danger, Crisp and D.Smith from his fake accounts.. In a league with a 12 round draft, his entire team is now made up from the first 5..
Decided to find the next best team and trade all my decent players to him in the hopes that he can field a better team than this other guys..
I’m in a few draft leagues, so content to not partake in this one. I personally think A.Brayshaw is must have. He is looking like this years Adams. Pure midfielder but classed as Def in AF. However if you are keen to have an amazing Bye structure get Westhoff. Question re: the rolling 22. Is it the best 22 players as of right now or the best 22 at the seasons end? Im pretty sure it is of right now, but i would love to see a hybrid of the two like a who you think will be in the best 22 by the seasons end so helps with targeting blokes for each line. ie: Fyfe in this week’s rolling 22 is ‘out’ but that is just based on a poor showing last week so going on seasons form you would likely have him there at years end.. just a suggestion. I think its top 22 loosely based on both according to Roy’s intuition mate. No one can truly tell who will be top 22 “by seasons end”. Some are obvious. Others are not. Who to bring in: Austin or Mihocek? Who to put out: Murray (if not playing) or Ridley? Austin will gain cash real quick with such a low BE. If you need to squeeze extra cash for any reason go Mihocek. If you have McInerney there already, getting in Jones is an option ahead of the round 13. No there’s point in doing in it now though, as you need to see him named first ahead of that bye (i.e., he has to hold his spot for two more games). McInerney could be traded out or swung forwards, to re-distribute the numbers of players missing in round 13. The bias for Sic dawg in the rolling 22 is obvious. Averaging 80, with a last 5 average of 96 but last three scores of 90 or less. Jack Crisp certainly should be in the rolling 22 ahead of Sicily & maybe even Kade Simpson: the guy’s averaging 93 for the season, with a 5-rolling average of 114! Also, Whitfield averaging 94, with only one score (70) out of the last 6 under 94. Better than Sicily. Tom Mcdonald’s last 5 average is also more than a few of the other defenders in the rolling 22. Better than Sicily. Roy clearly has biased man love for Sicily the same way he has for Rocky. Full lockout on Friday in Fantasy, so no captain’s loophole available! Partial lockouts start Round 13 (fantasy). Bye Rounds 12, 13 and 14 the highest 18 scores on your field count toward your score. Same emergency and captain rules apply. What to do with third trade? Currently gone Mutch -> Ahern and Keefe -> Austin, and have 340k in the bank. Looking to upgrade Taranto to Macrae next week so not too keen to spend heaps of cash. Some food for thought. Ben Ainsworth. $441K Suns FWD. After a highest score of 60 in the first six rounds, he has gone 90 70 92 84 after playing in the midfield more. He would be a great unique for the byes and you would hope for a 80 or 90 each round. Thoughts? Don’t tempt me. Got Ah Chee a few weeks back thinking he would get more midfield time. Boy, was I wrong about that. Ainsworth is just really awkwardly priced and comes with a huge risk. Can he keep up that scoring? If you field 22, the four lowest scores will not count. Your score will only count the BEST 18 players from the round including emergencies who are counted from donuts on field, so no if you had all 22 players playing your 4 worst won’t count. Which two to bring in for my 2nd and 3rd trades?